When the recent Christy Award winners were announced, I knew why. Cathy won the award for, "I Have Seen Him In The Watchfires," a civil war novel. Congratulations, Cathy! I'm thrilled at your success, and happy to share my thoughts about the book. Our hero, Robert Glover, is two months away from his 18th birthday. He's chafing under the promise he made his father that he wouldn't enlist in the Union Army until he reached 18. When a letter arrives from the beautiful Emily in North Carolina, all of his plans take a sudden detour. She informs him her father is in a Union jail at Fort Delaware and begs Robert to visit him. In his effort to find her father, he unwittingly becomes a pawn in an elaborate escape plan. Through serious illness, old friends, and a Confederate soldier following his dead commander's orders, he moves across enemy lines to help his mother and Emily. Will he make it or will the war consume him and those he loves? Cathy's second book establishes her as a force to be reckoned with on the Christian writing scene. Don't miss this high tension, down-to-earth view of history. Sounds good. I've heard of this one before and because of the title alone, I'd pick it up and look at the story blurb. While this book stands on its own, it's a good idea to read, "William Henry is a Fine Name" before picking up Watchfires. You'll get a lot more background and insight into the various characters. That said, I loved this book. When I picked it up, I was fully into the story. Cathy keeps the tension and excitement going, but still provides reflective moments. Thank you, Susan, for the enthusiastic book review! 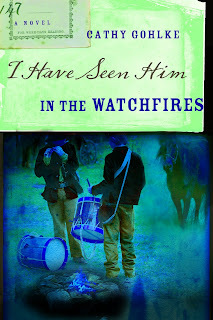 I loved writing "I Have Seen Him in the Watchfires." Most of the locations in the book are based on actual places, and can be visited today. The 12 foot coffee pot, in which Robert hid from the home guard in Salem, NC, still stands in Old Salem--though it has been moved to a different street since the time of the story (1864). I remember standing in front of that giant coffee pot as a child and thinking, "What a great place to hide!" Now I get to "live out" some of my favorite childhood fantasies through the printed page--how cool is that?! Jessica--you mentioned the title. When you read the book look for the title and its significance in the story. Although the title comes from "The Battle Hymn of the Republic" the particular words, "I have seen him in the watchfires," hold special meaning and life questions for Robert, the main character--questions we all face in the midst of frightening and confusing circumstances. I hope you enjoy Robert's journey! I'm looking forward to your next book. Please let me know when it's released. This sounds like a great book. I love historicals and there are so few set during the Civil War. It has now been added to my every growing to be read list :). As I said to another commenter, it's a good idea to read Cathy's first book, "William Henry is a Fine Name," before reading, "Watchfires." 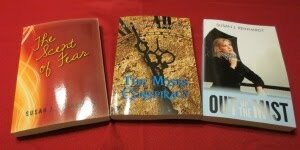 While "Watchfires" is a stand alone novel, it will be a richer experience if you read both.